Over recent seasons, tFS forum members have complained that Miu Miu’s advertising campaigns aren’t what they used to be. Proof? Not even the likes of Naomie Harris and Kate Moss could save the Fall 2017 campaign. The brand’s offering for Cruise 2018 just dropped and, despite impressive casting that includes Elle Fanning, Anna Ewers, Doutzen Kroes, Joan Smalls, Kesewa Aboah, Lily Nova and Slick Woods, the images fall flat. 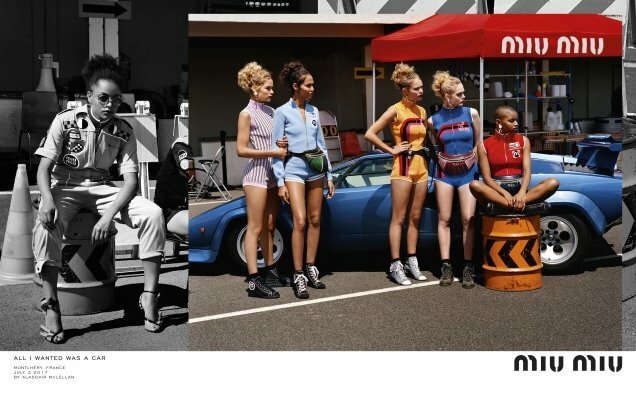 Photographed by Alasdair McLellan with Katie Grand in charge of styling, the crew headed to a race track in Montlhéry, France to lens the series of vibrant images, which ultimately failed to win over our forum members. “The theme doesn’t work, the photography doesn’t, neither does the terrible, terrible model casting. All on Katie Grand, I’m sure. 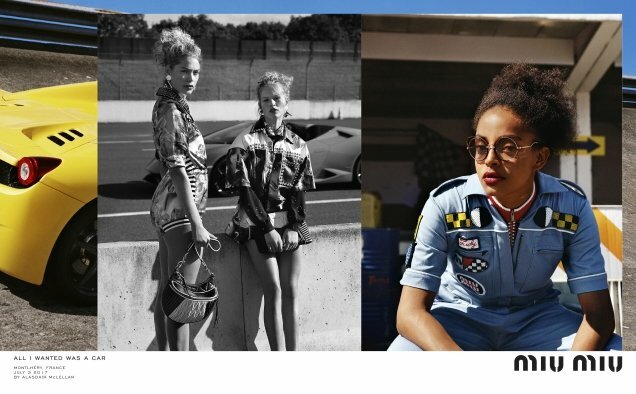 The passé Doutzen, Anna, Joan, a new yet incredibly dull and lesser Aboah, rounded out by Slick Woods. Surprised not to see Kendall here. Perhaps Miuccia [Prada] won’t have her,” wrote a disapproving Benn98 upon checking out the campaign. “Miu Miu, once my favorite brand, has become so irrelevant. Irrelevant models, irrelevant campaigns. Katie ruined everything. Fire her please,” pleased anlabe32. “It looks very cheap. Zara, Erdem x H&M look infinitely more luxurious and expensive than this,” criticized forum member apple. Fiercification wasn’t exactly thrilled with the outcome, either. “LOL, I really can’t stand the incohesion of these casts. This concept is not what Alasdair was built for,” he pointed out. “I’m all for letting the newer school of photographers take the lead in editorial and advertising, but I can’t help but think Craig McDean would’ve been a better fit,” kikifoz chimed in. Care to see more? Check out Miu Miu’s Cruise 2018 ad campaign in its entirety and add your own two cents here.